Work progressing well on EP8. We have too many songs on the go for it, so trying to whittle the number down to something reasonable. So far we have three definite tracks and twelve more to choose from. Happy new Year. We are working on EP8. More details soon. This website is now five years old, in that time, the rise of people looking at sites on their phones and tablets has increased. As such this site is now not very user friendly. So with the release of EP8 later in the year, expect a new sleeker, use friendly website. EP7 released. Avaialable from all good download sites and on streaming sites. EP7 is finished, awaiting artwork. It should be released sometime in November. Chris is doing a solo gig on Sept 5th at the castle grounds in Bridgnorth at 2:40pm. In February Chris decided to try and write fourteen songs in a month. He managed ten. Two of which were written with E. So one of the songs (Love is Overdrive) will be on EP7 and the other (The Distance) might be on EP7, but might be held back for EP8. There are some very rough demos on our Soundcloud. These will be removed soon. In other news Work is progressing well on EP7. We are both saddened by the death of Sir Terry Pratchett. But he will live on in the clacks!!! In an attempt to be one of the cool kids, we are releasing EP6 as a Bittorrent Bundle for the pricely sum of your email address. We have released the first video from EP6, for the track "Deep Down You Know That I'm Wrong". See the video page to watch. We have also set up a You Tube channel to host our videos in one place from now on. EP6 is available to preorder from Bandcamp for a very special price. It will be available to purchase from October 18th from the normal download places (Itunes, Amazon Etc). You can listen to some of it below. We have started work on EP7. Ep6 has been mixed and mastered. We are going to live with it for a week or two and then unleash it onto the world. We are currently working on some music videos. Mixing has started on EP6. Some re-recording will be taking place in the next week. We have decided to add another track to EP6. So there will now be five song on it. E has remixed Beijing morning and created a new video for the song. See the video page for more details. We have released the first video from EP5, for the track "Beijing Morning". See the video page to watch. 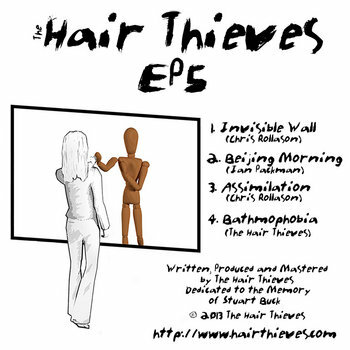 The Hair Thieves are delighted to announce the release of the only slightly delayed EP5 today. In the past we have spent many hours, cups of tea and Tesco's finest cookies in the writing and recording of this EP and for the most part, given the rarity of us playing live, very few people will get to hear it. To this end, we are offering the whole EP as a free (as in no cost at all, zilch, nada etc) download from your Bandcamp site. All we ask is that you have a listen. For your free download, please use the contact form (above in the menu) and we will post you a download code. If you hate it please tell us, if you like it, please tell us and either make a small donation, so we can record another EP ,or preferably, make copies and give them to a friend or three. If you are old fashioned, like us, and prefer a physical CD with original artwork, you can purchase one for the princely sum of £3 + p&p from Bandcamp. Which also includes a digital download of the EP. All monies received will be put towards EP6, which we are currently writing. The EP is also be available on ITunes / spotify / amazon etc if that is your preferred digital delivery medium. Due to the capitalist nature of our society, you will have to pay for these. Two days until we release EP5. It is available for pre-order on our Bandcamp page. You can also listen to the songs there. It is 50p to preorder (since Bandcamp, won't allow you to give away pre-orders). You can also order it on physical CD-R.
EP5 will be released on December 10th 2013. It is available for pre-order on our Bandcamp page. You can also listen to the songs there. It is 50p to preorder (since Bandcamp, won't allow you to give away pre-orders). There is a very limited edition physical CD-R of the EP. Photos of which will be on the band camp page in the next few days. The EP will also be available at ITunes / Amazon / Spotify etc. EP5 has been mastered. Artwork pending. Should be released before the end of the year. Not overly happy with EP5 mastered version, so some remixes and remastering will be taking place soon. Recording EP6 is ongoing and making good progress. EP5 will be mastered in the next week or so, for an August release. Art work has now been done.